It's less than two weeks before the ALPSP Awards for Innovation in Publishing are announced at the conference. In the latest in a series of blogs profiling the finalists, we asked Bill O’Brien, Business Development Director at Copyright Clearance Center (CCC) to tell us more about RightsLink for Open Access, a solution for cost-effective Open Access fee management for scholarly publishers. ALPSP: Tell us a bit about your company. BO: CCC was founded over 30 years ago at the suggestion of the United States Congress to provide an efficient market for the clearing of photocopy rights. Located near Boston, CCC now has more than 350 employees dedicated to serving the needs of over 12,000 publishers and providing innovative content and rights-licensing technology solutions for more than 35,000 customers around the globe. In the mid-90s, when publishers were struggling with how to best protect copyrighted material in a new online world, they worked closely with CCC to create RightsLink. RightsLink made it easy for visitors to a publisher’s website to purchase permissions and other services. 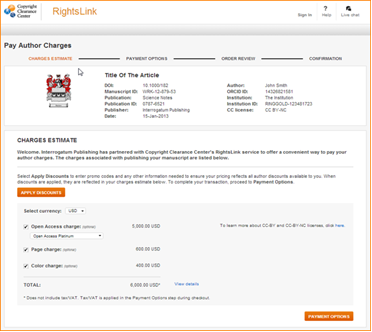 Years later, we collaborated with our publisher customers again to leverage RightsLink’s advanced ecommerce capabilities to manage article processing charges (APC) and other author fees for journal articles. This summer, we released a completely new and more powerful RightsLink for Open Access platform, with a range of new capabilities developed with input from customers and partners. BO: We were proud to submit our latest advance, RightsLink for Open Access, which offers advantages to both publishers and their authors. Its flexible and powerful features enable authors to quickly and easily submit APCs and other fees, while also supporting any pricing and discount model chosen by a publisher. Because it tightly integrates with virtually any manuscript editorial system, it ensures a seamless author experience. RightsLink for Open Access is a fine example of CCC’s culture of innovation. BO: There’s no doubt about it: Open Access (OA) is dramatically changing the business of scholarly publishing. Publishers, authors, universities, librarians, funders and customers everywhere feel its impact. By carefully listening to stakeholders in the editorial and publication workflow, CCC has developed a powerful OA platform that enables publishers to more easily collect and manage APCs and other publication-related fees. And because it’s been designed to be deployed by multiple publishers, yet customized for each publisher’s unique needs, it’s an effective way to serve the OA ecosystem. RightsLink for Open Access – a market-driven platform informed by user groups, roundtables, thought leadership panels, and discussions – maintains the proven advantages of the flexible RightsLink permissions solution while delivering distinctly new strengths. As always with CCC, our team starts with our customer. Input and ideas from our customers guide everything we do. Based on customer input, our goal was to create a simple user interface on top of a powerful rules and pricing engine that would help publishers deliver a common ecommerce experience for authors and institutions; provide publisher-specific messaging and branding; leverage metadata standards to support rich downstream reporting; and, ultimately, create a streamlined and satisfying author experience. BO: At every step, RightsLink for Open Access ensures that critical research gets published as quickly as possible. The platform enables publishers to maintain contact with their authors, implement their business rules, and reinforce their brand experience. In addition, RightsLink for Open Access provides publishers with the data they require to run their businesses more effectively and more efficiently. RightsLink for Open Access also provides publishers the flexibility to integrate directly into the publishing workflow through standard APIs. The rich metadata collected from the various systems in the workflow allow our sophisticated rules and pricing engine to tailor each transaction to the specific author and type of publication. RightsLink for Open Access uses standard APIs for ingesting manuscript and author metadata and for sharing manuscript and payment status information as authors move through the workflow. These APIs make it easy for RightsLink for Open Access to integrate with Aries Editorial Manager and other manuscript and production systems. Through the system's e-commerce capability, the author can pay by credit card or choose to be invoiced in a variety of currencies. Publishers specify pricing and are able to offer waivers and discounts, allowing them to experiment with different promotional models. Sophisticated tax software seamlessly handles sales tax, VAT, and the like, according to the publisher's tax rules. A real time reporting tool within the platform collects all transaction activity and metadata. CCC handles all billing, collections and distribution of funds in a scalable fashion. Using RightsLink for Open Access, publishers and their partners are able to store and associate manuscripts with new standards like ORCID, FundRef, Creative Commons License types, and Ringgold institutional IDs, which persist throughout the workflow. Moreover, at CCC, we understand the importance of standing with the publisher throughout the life of our product. Our consultative relationship does not end at '‘go live.” A Business Development representative continues to work with the publisher team to enhance and evolve the solution, and a Strategic Account Manager ensures personalized support. Success is measured by publisher growth, operational efficiency, and removal of friction from the workflow process, each of which is supported by world-class customer service. The new RightsLink for Open Access platform represents a huge step forward for publishers navigating Open Access waters. We’re excited to earn this nomination. BO: Over time, CCC will deliver incremental layers of functionality to simplify author workflows, starting with metadata-driven institutional pricing rules, and then leading to more sophisticated self-service tools and usage data relative to OA spending. As publisher and market needs continue to evolve, we pledge to evolve our services in kind to meet market needs. To help our customers stay on top of the dynamic OA market, we developed a free OA webinar series, which has so far drawn over 2,000 registrants. Our Open Access Resources Center, a joint effort with ALPSP, has attracted over 40,000 visitors in 2014, and provides links to a host of content addressing OA issues.